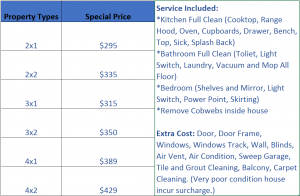 CKF Cleaning Services special fix price offer. This Winter Only!! CKF Cleaning Services services offer a thorough clean which meets all vacating lease conditions. Our customer and property agency love to work with us because our services provide a completely peace of mind experience. Therefore, do not worry if you are not sure about what is required to be cleaned. Most of all, we are the end of lease cleaning experts and we know the standard and duties. We also work on over 100 vacated property each month. Hence, feel free to contact us for free consultation.